Buying a brand new snowmobile can be very expensive so many people opt to buy a used one. One of the first things to remember is that you should never buy on impulse. If you’re new to snowmobiling, you might be very keen to get started but it’s important that you do your research first and know what you’re looking for. It also tends to be a lot less expensive if you're buying out of season -say in the summer months - as demand in the winter can push the prices up. The downside to that, of course, is that you won’t be able to test it out. If you don’t have much knowledge yourself, you should take someone along with you, if possible, who knows what to look out for. Like any kind of motorised purchase such as a boat or a car, for example, taking along an expert will prevent you from getting a bad deal and you’re more likely to be able to barter on price. However, here are some general tips for what you should be looking out for when buying a snowmobile. When arranging to go and inspect the snowmobile, always ask the seller to leave the vehicle cold before you arrive. Engines which have already been started up prior to you inspecting it are less likely to exhibit any problems. By starting the engine from cold, there is more chance that any malfunctions with the engine will show up. Make sure that you ask the seller to go through all of the switches with you so you can be sure that all of the electrics work properly. A used snowmobile is bound to have a few scratches on it but you should check that it hasn’t been involved in a crash. One of the ways you can determine this is to check the centre lines for any twists and make sure that the skis are aligned properly. 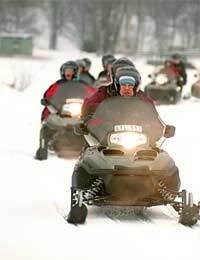 Unlike most cars, snowmobiles are often only used for about 3 to 4 months of the year. Therefore, careful owners will ensure that they are stored properly for the rest of the year. When not in use, good owners will have ensured that all the essential parts have been well lubricated to keep them rust free. Whilst some prefer to empty the fuel tank, if it has been kept full, make sure the right additive has been put in it to stabilise the chemicals and, if emptied, you need to check for condensation. Some people simply use a snowmobile to get around easier in difficult snow conditions whilst others will buy one for fun in order to race it. Try to establish what the snowmobile was mainly used for as one used for racing will have been put under more strain and this should be reflected in the price. Make sure that you ask for the service book. You’ll want to establish the last time the torque-converter and front suspension were serviced. Also check that the brakes work smoothly. In addition to checking the track and that the skis are aligned; make sure you look at the underside of the skis too for wear. The seat should be in good condition as well. If it’s torn or cracked in any way, it’s likely that it will retain water so it won’t be comfortable to sit on for any length of time. Check that the engine isn’t leaking any kind of fluid and look for signs of any discolouration in the radiator which could be an indicator of rust. Many sellers will often throw in accessories but don’t let these influence you greatly. What may seem like a great deal, particularly with the add-ons that are being included, may simply have been thrown in to try to deflect problems with the snowmobile itself. Things like a used helmet, for example, are worthless. Obviously, the price should reflect the overall quality of the snowmobile you’re looking to purchase. If there are certain problems that need to be rectified before you can take the vehicle out onto the snow, it does not necessarily mean that you steer clear of the purchase. However, you should ensure that you’ve a fair idea of how much it would cost to put things right and to use that as a bargaining tool when it comes to negotiating on price.